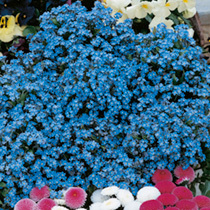 Ideal for spring beds and boarders, forget-me-not seeds look lovely when combined with tulips for edging. They naturalise very easily and grow well in most soils. This hardy biennial needs to be sown between May and September outdoors, to bloom between April and June the following year. Forget me not seeds should germinate within 2 to 3 weeks. In the autumn transplant the young plants to their flowering position 15cm apart, choosing a sunny or partially shaded site. Alternatively sow the seeds between August and September where required to flower and thin the resulting seedling to the same spacing; 15cm.